My initial question was answered for me on page ix. Jim Belushi says, "I'm writing this book because we, as men, need to raise our game to meet the challenge the women of the world are giving us". Mr. Belushi is not only the funny man we see on TV every Tuesday night, he's also a man, and has gone through the same mill many other men go through. Too often we tend to think of celebrities as being otherworldly. 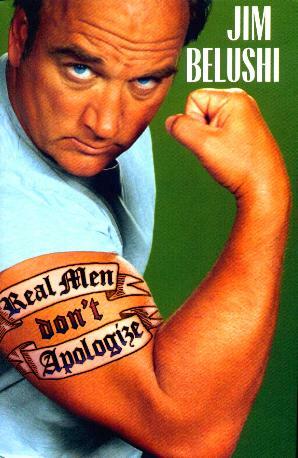 There's a saying: "Write what you know about", and I think Jim Belushi hit the nail on the head with this book. It's basically how to survive a relationship/marriage from a man's perspective. Ladies? You'll enjoy this book too. I loved his use of metaphors, especially the Clint one, and the quizzes are a riot. Avenues covered include "Pretending to Be a Lot More Interesting Than You Really Are"; "If You Don't Leave Me Alone, I'm Gonna Find Somebody That Will"; "Subjects All Men Must Be Versed In", and "Are You A Man? ", to name a few. He also says, "Men are woefully outmatched by women. All men have to offer is our competitive instincts and whether or not we can lift something heavy." My sentiments exactly! It takes a man to admit this. Hats off to ya! Visit Jim Belushi's website. And, I didn't mention his late brother. Till now. Sorry. Conclusion - Infinitely hilarious. Oh, who's Glen Clark?